35% of U.S. mass shooters are military veterans, as compared with 14.76% in the general population for the same gender and age. See documentation of this below. 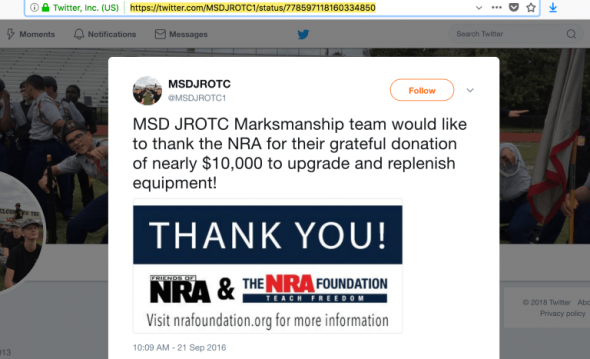 Whether the latest school shooter’s participation in a JROTC program that took NRA money and trained in marksmanship contributed to the shooting or not, it is symptomatic of a culture in which many schools are forgetting that The Junior Reserve Officer Training Corps Is Not a Substitute for Education. The worst kept secret in our gun-mad and war-mad culture is that U.S. Mass Shooters Are Disproportionately Veterans. Are veterans of the U.S. military disproportionately likely to be mass killers in the United States? Asking such a question is difficult, first because of concerns of profiling, discrimination, etc., and second, because it’s hard to answer. It’s important to answer because it’s important for us to know whether military training is contributing to this epidemic, a fact that (one must rush to say) would not somehow eliminate the roles played by gender, guns, mental illness, domestic violence, a violent culture, the mass media, economic inequality, or anything else. the creators of the list have not bothered to create a thorough record of which shooters had been in the military. Beginning to sort out an answer, one quickly discovers that many mass-killings by veterans have been excluded from this list. World War II veteran Howard Barton Unruh killed 13 people in 1949 in New Jersey, but that was too early to make it onto this list. Persian Gulf veteran Timothy McVeigh killed 168 in Oklahoma City in 1995 but didn’t use guns. Persian Gulf veteran Robert Flores shot his three nursing professors in Tucson, Arizona, in 2002, but only killings of four or more have been included. The same restriction keeps out U.S. Marine Corps veteran Radcliffe Haughton’s killing of three women in Wisconsin in 2012. Even the D.C. sniper, Persian Gulf veteran John Allen Muhammad, who killed 17 in the Washington, D.C., area in 2002, with a partner, and using guns, is not included — perhaps because he didn’t kill all of his victims at once. Proceeding with this list nonetheless, we should be able to determine what percentage of the shooters on the list are veterans, and then compare that to the general population. But how exactly do we do that? It would be crazy to look at figures for the general population as opposed to those for men only, because the percentages of men and of women who are veterans are very different. And even looking at men only, the percentage who are veterans in the U.S. population varies dramatically by age group. Almost all of the shooters are men, and almost all of them are between ages 18 and 59. Above age 59, the percentage of men in the general population who are veterans leaps up dramatically. Between 18 and 59 — by averaging the percentages for each age year — about 14.76 percent of U.S. men are veterans. What percentage of U.S. mass shooters who are men between 18 and 59 are veterans? Deleting two shootings from the list that were done by females, and one that was done by a man and a woman, and deleting eight done by men too old or young to fall into our sample, we’re left with 83 mass shootings to look at. I then delete one that was an attack on the U.S. military by a foreign-born shooter, as it seems irrelevant to ask if that shooter had been in the U.S. military. That leaves a list of 82 shootings. In quickly reading available news reports online about each shooting, I see that almost all of the shooters were born in the United States. And I am leaving in the sample list those few that were foreign born, even including some who could not legally have joined the U.S. military had they wanted to. And I am not attempting to find out which shooters received military training from some military other than the U.S. I am also leaving on the list those who said their motivation for shooting was revenge for U.S. wars. And I’m leaving on the list but not counting as veterans two men who tried to join the U.S. military and were rejected, as well as one who worked at a U.S. Navy base but apparently not as a member of the Navy. I am leaving on the list and counting one whose military training was in JROTC, and about whom I do not know whether he had further military training. 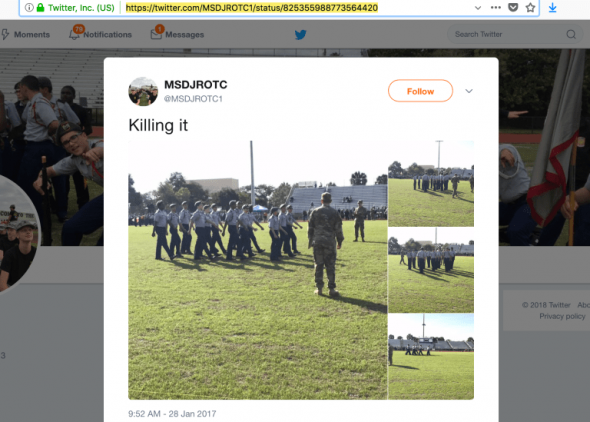 Following a quick search of 82 shootings on the internet, I’ve been able to find that at least 29 of the shooters had been in the U.S. military (again, including the JROTC in one case). On the other side, I’ve been able to confirm very few of the shooters as having not been in the military. In several cases I’ve had to read several articles before finding a mention of the military. In no case have I found a mention of having not been in the military. This leads me to strongly suspect that the number 29 undercounts the number of veterans in the sample. Nonetheless, that’s 35% of U.S. mass shooters who are military veterans, as compared with 14.76% in the general population for the same gender and age. In other words, veterans are over twice as likely to be mass shooters, and probably more likely than that. Needless to say, this is a statistic about a large population, not information about any particular individual. Needless to say, profiling and discrimination are counterproductive. But here’s what else might be counterproductive: Training people in the arts of mass murder, launching wars, and dropping people trained for wars and having suffered through wars into a heavily armed society full of economic insecurity and the industrialized world’s leading lack of healthcare. Here are the shootings by veterans on this list: Texas First Baptist Church massacre, Florida awning manufacturer shooting, Fort Lauderdale airport shooting, Baton Rouge police shooting, Dallas police shooting, Umpqua Community College shooting, Trestle Trail bridge shooting, Fort Hood shooting 2, Washington Navy Yard shooting, Sikh temple shooting, Seal Beach shooting, Fort Hood massacre, Carthage nursing home shooting, Northern Illinois University shooting, Damageplan show shooting, Wakefield massacre, Caltrans maintenance yard shooting, Fort Lauderdale revenge shooting, Air Force base shooting, Luigi’s shooting, Watkins Glen killings, Royal Oak postal shootings, Luby’s massacre, ESL shooting, United States Postal Service shooting, San Ysidro McDonald’s massacre, Welding shop shooting, Xerox killings, and Seattle cafe shooting. Here are the shootings on this list that I have not been able to determine were by veterans: Walmart shooting in suburban Denver, Edgewood business park shooting, San Francisco UPS shooting, Pennsylvania supermarket shooting, Rural Ohio nursing home shooting, Fresno downtown shooting, Excel Industries mass shooting, Kalamazoo shooting spree, Planned Parenthood clinic, Colorado Springs shooting rampage, Charleston Church Shooting, Isla Vista mass murder, Hialeah apartment shooting, Santa Monica rampage, Pinewood Village Apartment shooting, Sandy Hook Elementary massacre, Accent Signage Systems shooting, Aurora theater shooting, Oikos University killings, Su Jung Health Sauna shooting, IHOP shooting, Hartford Beer Distributor shooting, Coffee shop police killings, Atlantis Plastics shooting, Kirkwood City Council shooting, Crandon shooting, Virginia Tech massacre, Amish school shooting, Capitol Hill massacre, Living Church of God shooting, Lockheed Martin shooting, Hotel shooting, Wedgwood Baptist Church shooting, Atlanta day trading spree killings, Connecticut Lottery shooting, R.E. Phelon Company shooting, Walter Rossler Company massacre, Chuck E. Cheese’s killings, Long Island Rail Road massacre, 101 California Street shootings, Lindhurst High School shooting, University of Iowa shooting, GMAC massacre, Standard Gravure shooting, Stockton schoolyard shooting, Shopping centers spree killings, Orlando nightclub massacre, Binghamton shootings, Trolley Square shooting, Dallas nightclub shooting, Tucson shooting, Westroads Mall shooting, Cascade Mall shooting.